A MUST-HAVE FOR EVERY FILMMAKER! 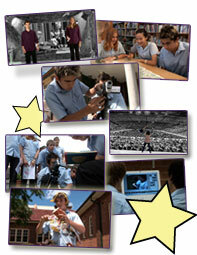 MFSF was designed to be a complete course for primary and secondary schools, but the DVD is a fantastic introduction to filmmaking for anyone. The new At-Home DVD version of Making Fantastic Short Films will be available soon. Students, film enthusiasts, and would-be filmmakers eager to make their short film to submit to the myriad of festivals now available world wide will love this informative resource. Designed for kids and teenagers, ages 10 - 18, anyone of any age that's new to film and interested in filmmaking will love this DVD. The recommended retail price is $49.95 Australian (including GST). But if you join the PRE-ORDER LIST, you'll get one of the very first copies for half price! Just $24.95 (including GST). But be sure to join the PRE-ORDER LIST today, because once this product is released, this offer will be removed. Simply email mfsf@embryo-films.com with the subject "PRE-ORDER LIST", and include your contact details. We'll contact you as soon as it's ready for release.